Located in the lively town of Mykonos, within 1 km from Megali Ammos Beach, the traditionally-built Vienoula�s Garden Hotel features a pool with sun terrace and a snack bar. Enjoying a quiet, yet central location, in the heart of Mykonos Town, the family-run Carbonaki Hotel offers accommodation with free WiFi access. It includes an outdoor hot tub and a cocktail bar. 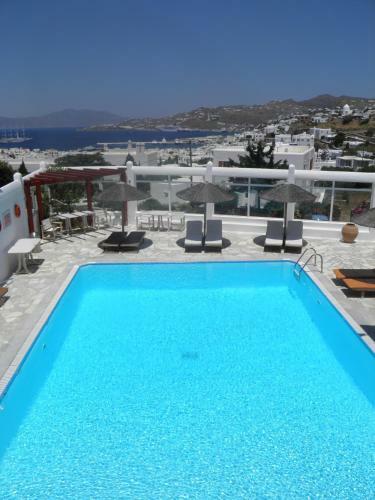 Overlooking the Aegean Sea and the town of Mykonos, Hotel Despotiko features airy rooms with sea, town or pool views. Guests have easy access to Megali Ammos beach. Penelope Village is located 100 metres from the scenic coastline of Kalo Livadi. It offers panoramic sea views and features an outdoor pool, hot tub and free public WiFi. Exceptionally situated in the centre of Mykonos, the Mykonian style Petasos Town Hotel is just 400 metres from the port. It offers terrace with panoramic town view, free transfer service and an internet corner. Anastasios Sevasti is set in a quiet hillside location enjoying panoramic views to Mykonos town and the Aegean Sea. It offers air-conditioned rooms, a swimming pool with sun terrace and a gym. 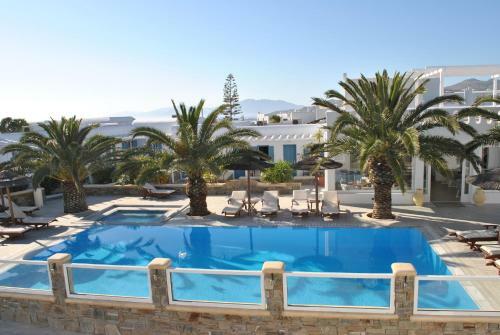 Andromeda Residence is just 2 minutes� walk from Mykonos Town centre, famous Matoyannia and Little Venice. Set within a peaceful courtyard, it features renovated apartments with free Wi-Fi around a swimming pool. Enjoying panoramic views over Mykonos Town and the Aegean Sea, the whitewashed Hotel Charissi offers air-conditioned accommodation with a furnished balcony. It includes a lounge snack bar opening out to a large veranda. 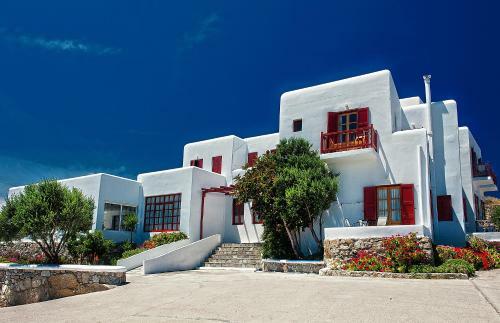 The Cycladic-style Petinaros Hotel is located 800 metres from the cosmopolitan Mykonos Town. It offers units with free Wi-Fi and a furnished balcony or patio overlooking the garden or pool. Just 150 metres from Corfos Beach and 2.5 km from Mykonos Town, Corfos features Cycladic-style, air-conditioned rooms with free Wi-Fi. There is a large, seawater outdoor pool on site. Overlooking Mykonos Windmills, the Poseidon Hotel Suites is only 50 metres from Megali Ammos Beach. The 3-star hotel offers a freshwater pool, and bright rooms with air conditioning and fan. Portobello Boutique Hotel is less than a 10-minute walk from the Old Port and boasts spectacular views over the Aegean Sea. It offers rooms with internet and a 32-inch LCD TVs with satellite channels. 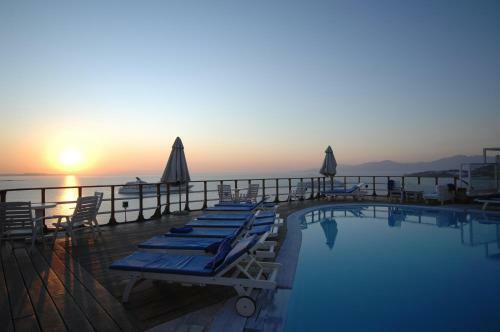 Mykonos View boasts Cycladic-style accommodation with views over the Aegean Sea and Mykonos Town. It features an impressive swimming pool, a 24-hour lounge bar and a breakfast area with sun beds. Wi-Fi is available in public areas. The small luxurious boutique hotel is a mere 800 metres from Mykonos centre. It offers a large pool with hydromassage facilities, and elegant accommodations with free port/airport transfer and free Wi-Fi. 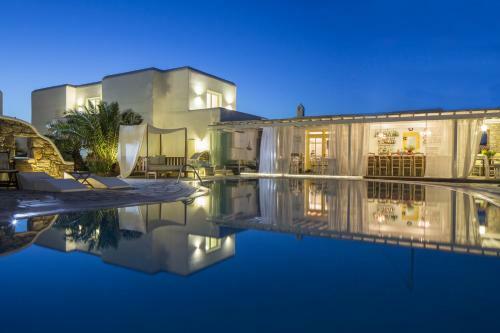 Set in a quiet countryside area only 15 minutes' walk from Mykonos Town, The A Hotel by Mykonos Arhontiko offers charming accommodation with a swimming pool and hot tub. Guests enjoy free Wi-Fi and free shuttle service.